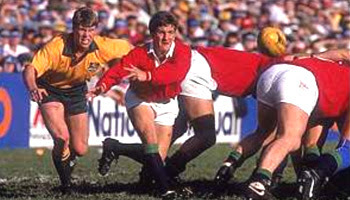 On this British Lions tour of Australia, the team was pretty infamous for it's aggressive approach, and the odd punch up was never out of the question. Here you see the scrum halfs having a full go, and everyone else joins in! This is a great hit on Mark Andrews by what looks to be Dan Hyde of England. It's the Barbarians playing against them at Twickenham, and as far as I remember, this was South African Andrews'last international game. At the end, they gave him a chance to convert a kick, but he missed hopelessly and almost took out the touch judge. 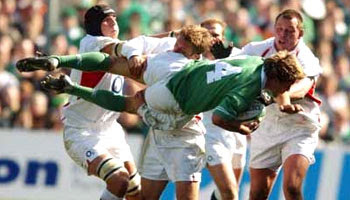 Jonny Wilkinson has always been a great tackler. Here is an awesome clip of him nailing the Irish winger Justin Bishop in the 2003 Six Nations Championship. Wilkinson put in three good tackles in that sequence of play. One was a covering effort, one was head on, and the other was an awesome dumping tackle on Bishop. Bizarrely enough these days that would be called a dump or dip tackle, and get him penalised and maybe even yellow carded. Back then though - great hit. Have a look at Jonny's big hit on Emile Ntamack over here. Gio Aplon is a young fullback from Western Province (South Africa) with a big future. He's tiny, but very very quick and extremely talented. He also is one of the best tacklers around apparently, so size isn't an issue for him or his coach. This try won Supersport's Try of Year award. Watch out for this guy in the future. I found some funny rugby adverts. I'll keep adding more to this post, so if anyone has anymore good ones plz let me know. This is an ad about some All Black fan doing the Haka in the middle of town. A bit odd, but funny to watch anyway! In the 1999 World Cup Semi Final, Stephen Larkham broke the heart of every South African by dropkicking a 40 meter kick to knock them out of the tournament. Larkham had never dropped a kick in a game before, and is known more for his brilliant running game than kicking. This ad is hilarious. If anyone has a better quality version plz send. This is an ad for the Super12 featuring the Aussie players. They sing while playing. Clever, but they look very gay in it!! Very cool ad featuring the players from this tour playing the game we like to call British Bulldog, or Bullrush in some countries. Quite a long clip, but a great ending. This is an excellent ad featuring some of the top players from a few years back. Very well made. Apparently university made for Adidas, this ad is awesome. Wilko and Becks teaching eachother how to play their respective sports. This is a current South African advert that is absolutely brilliant for the simple reason that the song is really catchy, and the guy (Robbie Wessels) is dancing around like an idiot. Apparently some people have complained about the ad though saying that in Afrikaans the word 'Leeuloop' refers to when drunk men take off their clothes and walk around like a lion, with their 'tackle' between their legs! Whatever it means, still a very entertaining ad! 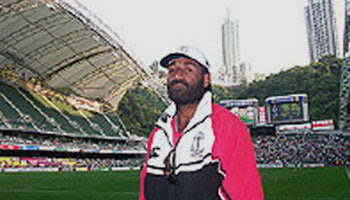 This sensational last minute try by Fiji's Tomasi Cama wins them the cup at Hong Kong in 1990 against the All Blacks, which features a young Waisele Serevi. It's widely regarded as one of the best Sevens tries of all time, considering how valuable a try it is, in the final. Vesi Rauluni throws the wild pass to Waisele Serevi with the defence closing in. Serevi quickly taps it over his head to Noa Nadruku, who throws it between his legs to the flying Tomasi Cama who runs around All Black winger John Gallagher for a try between the sticks. Cama is apparently a coach these days, but if anyone has any more info please let us know. His son actually plays currently, ironically playing for the New Zealand Sevens team. Carlos Spencer - Zidane of Rugby? 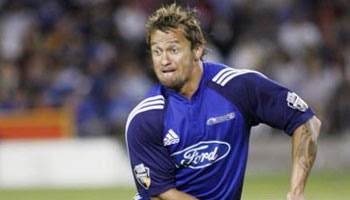 Carlos Spencer is a legend of New Zealand rugby. After playing in NZ for Auckland, he went to Northampton in England, and as you can see by this video, is still up to his old tricks. Carlos Spencer is a living legend. On form he was unstoppable. He's changed the game with his spontaneity on the field, and the 'banana reverse chip kick' (which has almost become a part of the game these days) was his creation. A hard man, and a huge talent. I still think it's a pity he left NZ when he did, but then again, Dan Carter has been a more than capable replacement for the All Blacks, albeit a totally different type of player. This try just shows the cockiness and pure confidence of the man. I love the way he walked all the way over to the corner and took his time putting the ball down. Brilliant.